Authentic vintage hardcopies were primarily cast in brown (carbalon) and green (dynacast) urethane, although a few other colors, like gray and black, show up on occasion. This Nikto unpainted hardcopy is cast in a blue urethane, which was not used during the vintage Star Wars era, however is extremely commonplace on modern day hardcopies. So, how is it that a vintage hardcopy was crafted in a material which doesn't correspond to its era? 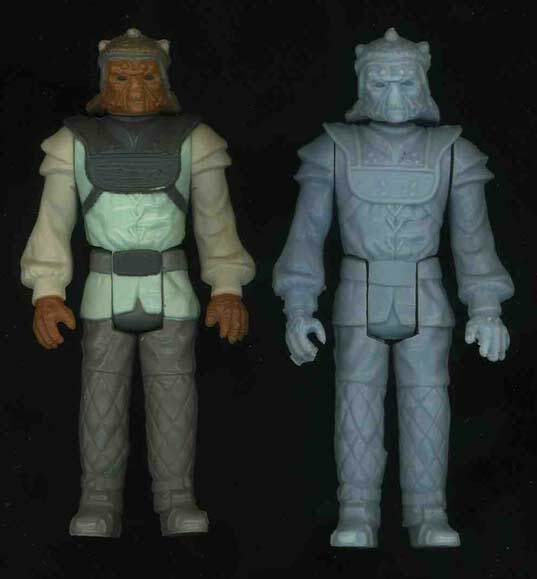 During the early 90's, authentic vintage action figure and Micro Collection silicone molds were used inside Kenner to create hardcopies for sale on the secondary market. Thankfully information came to light years back to debunk the claim that these "Blue Harvest" pieces were authentic prototypes. While they were cast from the original silicone molds, they played no part in the production process. This characteristic makes them reproductions, although somewhat more collectible than a typical reproduction item due to their place in hobby history. It's imperative to note that "Blue Harvest" hardcopies hold a small fraction of value compared to authentic unpainted hardcopies. 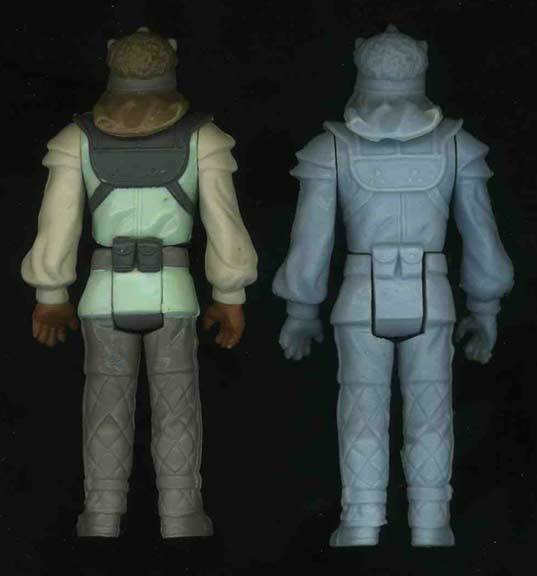 Each image shows the "Blue Harvest" unpainted hardcopy (right) along with a production quality Nikto action figure (left). As one may notice, the detail of the hardcopy is much crisper. Minor detailing is lost during the late stages of the production process. The blue hardcopy may be entirely disassembled, a characteristic also true for legitimate hardcopies, provided the limbs have not been glued in place. The limbs and head attach to the torso via small metal dowels. I added this piece to my collection as I felt it nicely matched the authentic dynacast unpainted hardcopy, which may be viewed here. A "Blue Harvest" hardcopy certainly isn't necessary in a pre-production figure series, but does offer a nice visual contrast to a dynacast hardcopy when available.